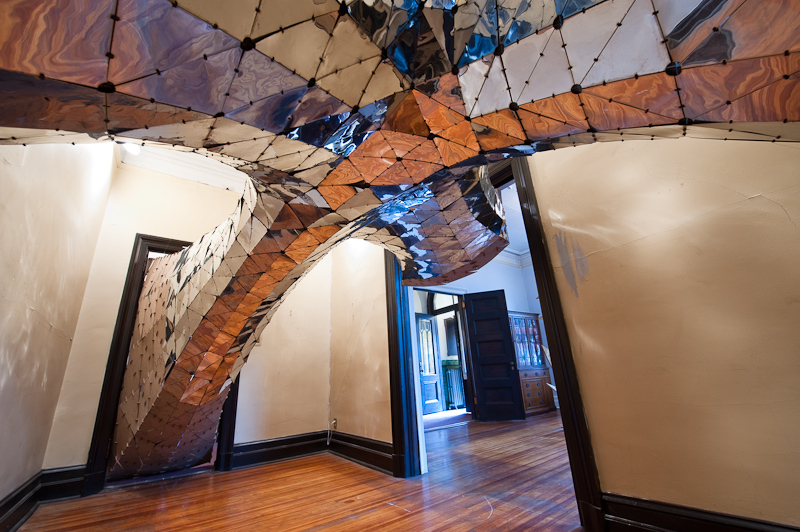 pAlice is a site-specific installation made of over 2400 laser cut triangular panels and over 3600 custom connections. All of the tooling and labeling was automated using a custom MEL script. pAlice was featured as part of the SYSTEM:SYSTEM exhibition. A failing economy decided the fate of 21 Monitor Street in Greenpoint, Brooklyn. Formerly a nun’s convent, the grand three-story house now stands uninhabited due to the declining membership of St. Cecilia parish and its sister school. Rather than let the building fall into disrepair the parish has found ways to breathe new life into it through a rotating schedule of film shoots, screenings, dance performances, and art exhibitions. system:system was a three-day event that reflects on the nature of associations between parts of a whole. The title is a play on the term “complex systems,” which are characterized by their connections and tendencies toward unpredictable behavior. The organizing of this event evoked these qualities and embraced the small world phenomenon of strangers being linked through minimal degrees of separation to form a dynamic structure. The unoccupied nun’s living quarters showcased work that experiments with the building up and/or breaking down of systems: mathematical, scientific, social, economic, and otherwise. Much like the social and economic factors responsible for this event, the behavior between the separate elements—artistic interventions and performances—resulted in an atmosphere of emergent interconnectedness. The act of creating artistic content in a temporary context will feature prominently, remaining true to the fluid way in which these works were executed. pAlice is made of over 2400 laser cut triangular panels and over 3600 custom connections. All of the tooling and labeling was automated using a custom MEL script. The geometry of the piece connects all openings in the room, turning the room inside-out and giving viewers a direct reference to the exterior of the room without physical access to it. Viewers can also look inside the surface from the outside of the room and see a volume that is the average of the pre-existing openings into the room. The name of the piece is a reference to the idea of an Alice Universe which can be considered to allow at least two topologically-distinct routes between any two points by nature of being doubly connected. pAlice also references Lewis Carroll’s Alice Through the Looking Glass. The highly specific geometry of the piece is covered in mirrored panels that camouflage the form by reflecting the interior of the room, wrapping the piece with the same texture as the interior of the room, completing the formal surface as an inversion of the room. Curated by Christina Vassallo and Adam Henry.